• Ripe papaya fruit is best eaten raw, while green fruits are preferred for cooking. • Use scooped out papaya halves as a serving dish for fruit, chicken or seafood salads. • Season green papaya with cinnamon, honey, and butter. Bake for a delightfully different side dish. • Cut in papaya half, sprinkle with or lemon juice, port or rum, and a sprinkling of sugar for a quick, fresh fruit dessert. • When adding papaya to fruit salads, add it at the last minute so its enzymes will not soften the other . • Try substituting green papaya for winter squash. Drain off the white, acidic sap first before using. • For a pepper substitute, try ground papaya seeds. • If you are using the papaya for the fruit alone, peel first before slicing and seeding. • Use only cooked papaya or pasteurized papaya juice in gelatins or it will not firm up. • Pureed papaya added to a marinade will not only give a tropical flavor, but also tenderize meat and poultry. • Overripe fruit can be pureed and used as a sauce for ice cream, a topping for pancakes, or stirred into yogurt. • One medium papaya should yield 1 to 1-1/2 cups chopped fruit. • One pound fresh papaya yields about 2 cups sliced. 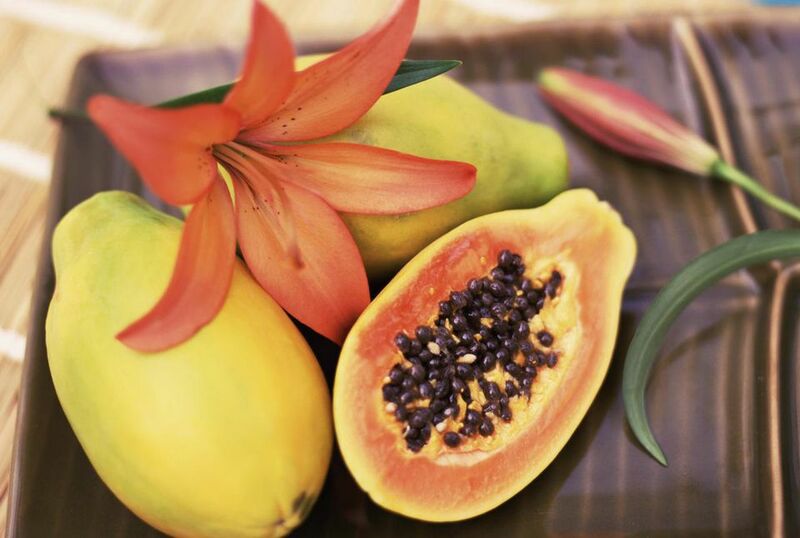 • Fruits that go well with papaya: Mango, passionfruit, kiwifruit, and most berries. • Complimentary herbs: Chives, cilantro, basil, mint, and .